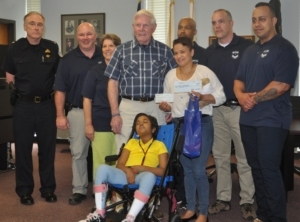 SPRINGFIELD – The regional charity Cops for Kids with Cancer and members of the Springfield police patrol officers union on Friday donated a total of $12,000 to two Springfield families with sick children. Cops for Kids with Cancer presented each family with a check for $5,000 during a brief ceremony in the two families. The union, International Brotherhood of Police Officers, Local 364, contributed another $1,000 to each family. Presented with checks on Friday were Llulys Guerrero and her daughter Alejandra Mercedes, 8, and Tina Palantino and her son Landen, also 8. In addition, the two children each received a gift basket containing a teddy bear, a hat, replica police badges, stickers and gift certificates. Alejenadra was diagnosed with leukemia about a year ago. Landen has a form of brain cancer and had an operation in December to remove a tumor from his brain. The money is intended to help the families with living expenses while their child is undergoing treatment. Robert P. Faherty, board chairman for Cops for Kids with Cancer, said when the all-volunteer organization was formed, it was intended to donate money to police officers whose children were diagnosed with cancer. Originally it was focused on donating money to hospitals to help with treatment. Since 2008, the organization decided to also contribute money to families of children with cancer. Back then, fund raising money was directed primarily toward cancer treatment and research, Faherty said. ‘No one was raising money for the families,’ he added. Parents of sick children commonly have to miss time at work while they tend to their child’s health. There are also added expenses such as travel and parking costs associated with traveling to hospitals. The money is intended to make it easier on families during is already a stressful time. He said the group has so far made $5,000 donations to 453 families. Families are selected when they are recommended by local police or hospitals. ‘We make six donations a month, all over New England,’ he said. Joseph Gentile, president of the Patrolmen’s Union said the union raises money each year through fundraisers, including an annual golf tournament in honor of fallen officer Kevin Ambrose, who was killed in the line of duty in 2012. The money raised is donated to local organizations including Open Pantry Community Services. 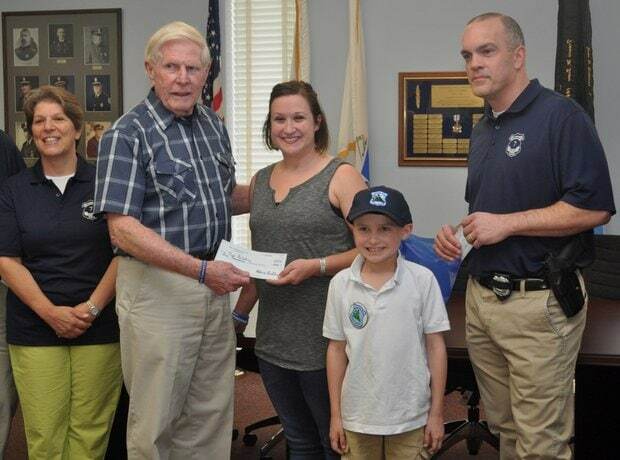 The union has worked previously with Cops for Kids with Cancer – in 2014, it donated $10,000 to the group – and when notified it would be presenting $5,000 to two Springfield families, the decision was made to add $1,000 on top of it. ‘This is a great organization,’ Gentile said. Guerrero said she was happy to be selected for support as she cares for her daughter. ‘This is beautiful work helping families,’ she said. Palantino said ‘This is absolutely amazing.’ She said she has had to take time off work to care for her son as he undergoes treatment, and the gift will help them get by with the loss of income. ‘I’m able to stay at home longer and treat him while he is going through this,’ she said.